Take full advantage of your Big Farm tractor by matching it up with a Britains Big Farm trailer, for hauling goods, animals and crops. If you want to make the most of your Britains Big Farm tractors, then you'll going to need a trailer to take full advantage of the play value in these big farm toys. When we talk of tractor trailers, we're not talking about toy farm implements that plough, cultivate or process crops, we mean trailers for carrying toys, rocks, sand and mud. 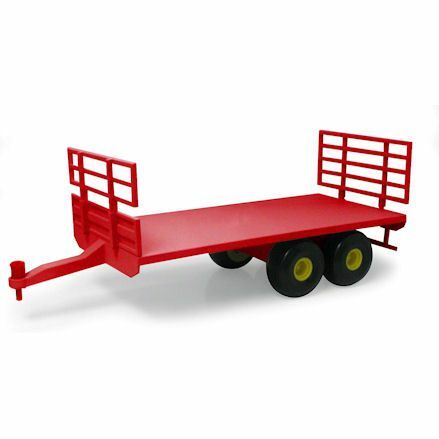 So to create more activity surrounding your tractor play, pick a 'Big Farm' toy tractor trailer that is made for all purposes - like hauling farm sundries, accessories and machinery. 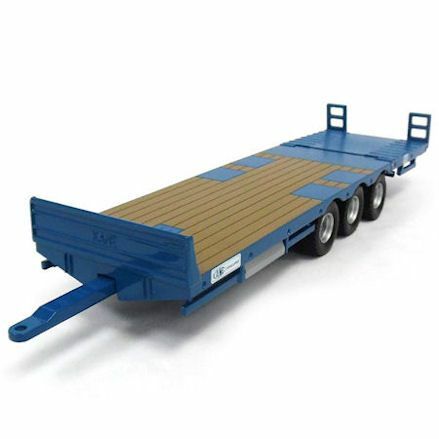 These include general purpose trailers, low loaders, tipping trailers, horse boxes, animal and cattle trailers - all made to fit Big Farm tractor rear hitches. 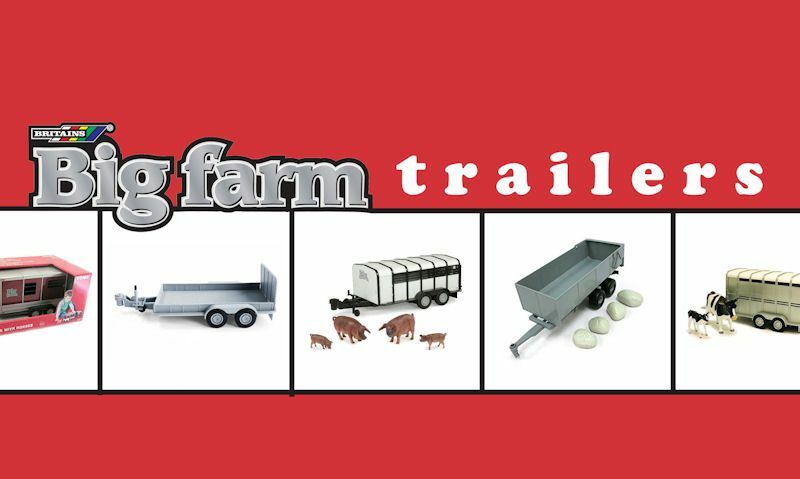 You can't have a series of trailers in your toy range if they're complicated to use, thankfully the Big Farm series is probably the easiest to use. This is due to a basic hook and loop design. Basically, any trailer has a hook tow bar, no complicated mechanism just a simple hook that connects to the loop - which in this case is the rear hitch. So well the hook is found on trailers, the loop is fixed to the rear of a Land Rover or tractor, and acts as the hitch. So to confirm, the hook is the tow bar on trailers, the loop is the rear hitch on vehicles. Its not possible to tempt kids into play without fun, purposeful functions, and all those that are featured replicate the real life trailer. As expected, any Big Farm trailer that is designed to haul animals will have fold down rear tailgate, which in turn easily folds back up. Then where there's trailers for use with crops, again you may have an opening door to view the interior. But in case of crop carrying trailers, there is always a tipping up action present, with an automatic opening real tailgate to offload. In theory, all trailers should have some sort of wheel jack. This bar is used when the trailer is not being towed and is stationary. You lower the jack to the ground so the trailer stays up right and balanced. 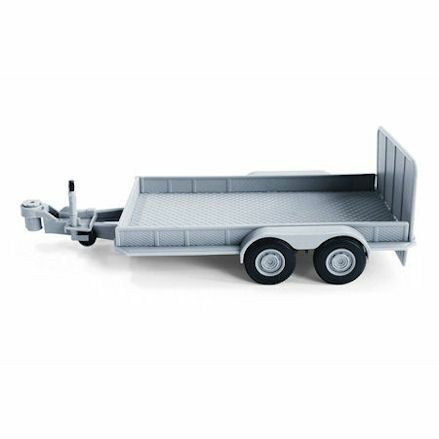 Most of Britains trailers are on a twin-axle and the reason why a wheel jack is needed. When you buy a Big Farm trailers, bare in mind non of there models have electrical parts, so therefore no batteries are required. You can rest assured that when the trailers are outside getting wet, muddy and used with rough hands, damage can't be done to the circuitry, because there isn't any. A misconception of why Britains Big Farm trailers might be battery operated is because the Big Farm series is indeed based around sounds and noises. But let us reassure you, the battery operation is only restricted to the vehicles, such as all tractors and Land Rovers - but no trailer is battery operated. There's no fixed use with the following trailers, they come with there own accessories to extend play value, but really they can be used anyway way they desire. Multi-purpose trailers means just that. Though you will find they will be hauling random items more than anything else. Also bare in mind the small, low baring trailers are suitable for the Land Rovers, well the bigger, heavy-duty trailers should only be towed using a tractor. In our opinion, this single axle, Britains Big Farm tipping trailer is the best trailer available, complete with a tipping up action and opening tailgate - with rocks. And as its designed for heavy-duty use, we highly recommend you use it only with Big Farm tractors, its not designed for Land Rovers here, or in real life. Has it comes with four shiny polished rocks, your ready to go right out of the box. But this trailers is made from durable plastic and is hard wearing, so feel free to add more - unpolished - rocks to it if they wish. Well sitting on a twin-axle, the trailers does tip up to offload, at the same time the tailgate will go up to allow the load to full out. 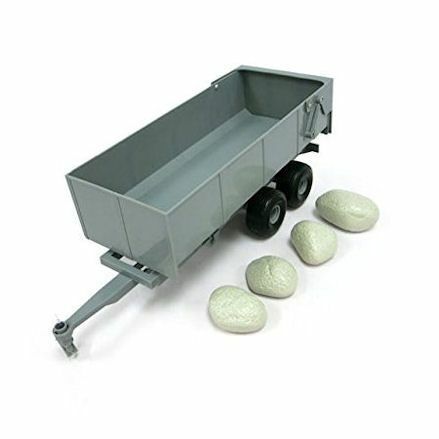 Sometimes you just need a general purpose trailer for hauling anything you have around the house, garden or farm - this could be rocks, sand and gravel from the garden. A good but cheap option is this general purpose trailer for attaching to both a tractor and Land Rover for pick-ups and delivery of supplies, machinery and even animal feed. Not a lot of features on this one, but in this case it does offer a heck of a lot more play value then many others. It can carry anything, well fancier trailers can only be used only for there intended use. An easy to use fold down rear tailgate allows access to the flat bed, well it all sit's on a twin-axle well the wheeled jack has to be used when the trailer is not being towed. For something a bit more fancy, go for a Kane silage trailer for hauling silage off the fields and back to the farmyard to dump in the silo for use as cattle feed later. How does a Britains Big Farm Kane silage trailer work actually. To be honest, its not hard to understand - its a simple trailer only to be used to haul silage. You see the silage trailer is towed by a tractor in tandem with forage harvester running beside it well filling up this Kane as it cuts the grass and empties it into this high-top trailer, through the forager harvester spout. And like in real life, once back at the farm, this trailer tips up and then the rear tailgate opens up to release the freshly cut grass trimmings. Then its off to the field to fill up the Kane silage trailer again. Most farm implement's are made strictly for the purpose they are built for, and are not made to be towed on main roads. Instead, they are collected and delivered on low loader trailers, with a ramp to help load on wheeled farm equipment. That's not all, low loaders help support heavy weight of bags of crops and sundries, and are easily loaded onto a trailer when its low down to the ground. The tailgates fold down into ramps used for wheels (so will work with the Big Farm Bobcat skid steer) and smaller vehicles like quad bikes from similar brands. 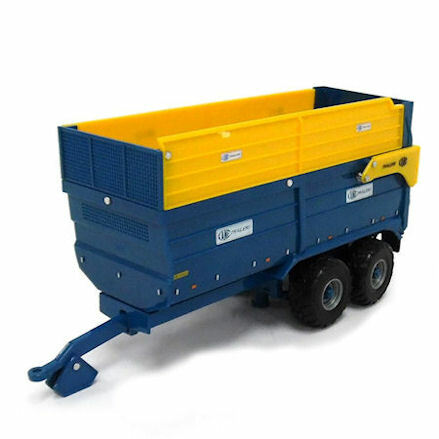 To get you started, this Britains Big Farm low loader comes with two large sacks, so would be ideal for use with other 1:16 scale farm toys where they are not available. Probably Big Farm's first released trailer within the series, and a basic trailer it was too. This flat bed trailer, or to be more precise, bale trailer is designed specifically to transport rounded bales of hay - in a single level or double. If you take the two end support bars, this is designed to hold and support the bales to stop them rolling off. No support on the sides so they can easily be lifted onto the trailer by a tractor with front loader or a telehandler. The trailer is balanced on a twin-axle, and will become off-balanced if the trailer is not attached to a tractor anytime. Big Farm bales can still be transported on this trailer even though its a retired item. The most required type of trailer on the farm, so a cattle trailer will be a welcome sight if you own 1:16 scale cows of any kind - be it Big Farm or Bruder cows and bulls. They're made to look metal in appearance, when naturally they are always made in durable plastic - though real metal is used in the fixings. Its all about directing cattle into the trailer so there's rails that swing open and connect with the fold-down ramp to act as cattle hurdles. Britains cattle trailers are small and compact, designed to work with their Big Farm Land Rover series or used with the tractors. If you own a Bruder or Britains cows, then a Britains cattle trailer will do just the job, built to carry up to two cows with ramps and rails for loading and offloading. One of the first models to be released in the Big Farm series, this trailer can be towed by a tractor or Land Rover, depending on your needs. It comes with a black and white cow and calf, both of which are transported in the trailer. Interestingly, it operates like the real life equivalent, first the rear door folds down and becomes a ramp, then the support bars fold out for safety and hurdle rails. Once the cows are in, fold it all back up, close the rear door and away you go. Currently there's only one Big Farm baler in the series, and we call it a trailed baler because it means it has to be towed to work. Usually baling grass to make silage is done with a forage harvester, though smaller trailed balers are used for smaller jobs. Its just like a trailer, so treat it as so; you can quickly and easily fixed it to any tractor in the Big Farm series with a big hoop design tow bar. It can be stored in a implements shed and then taken out to the field to cut the grass into bales once the grass is grown and ready to be cut. We think you'd have to agree, that this John Deere round baler will match up to a Big Farm John Deere tractor beautifully, so try to make that your priority. And like any Britains Big Farm trailer, this is a trailed baler, meaning it has to be towed behind a trailer for it to harvest the field to create bales. The standard two bar will fix to any Big Farm tractor (not just John Deere like we suggested) well the single-axle is supported with two front smaller wheels. 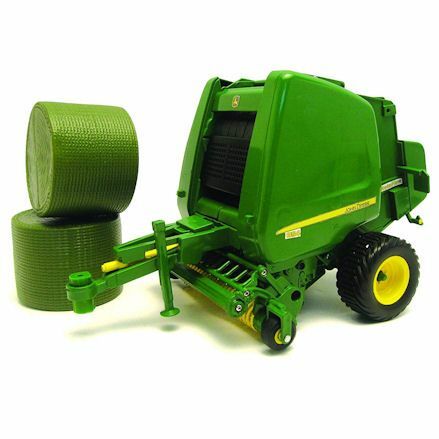 The John Deere baler comes with two green bales, representing cut grass. You could go for a standalone trailer (and there's a few to choose from) or you could get up and running straight away with a Big Farm trailer that comes with a Land Rover. Only go for a Land Rover with trailer set if you don't already own a Rover, you don't want to end up with two Land Rovers in their collection when a tractor will be more welcomed. Land Rovers are different in one is blue and the other is green, and well the trailer they come with are identical, the accessories they offer are not. And therefore well one offers more items, this results in a higher price. Though if bought separately, this will cost you a little more. 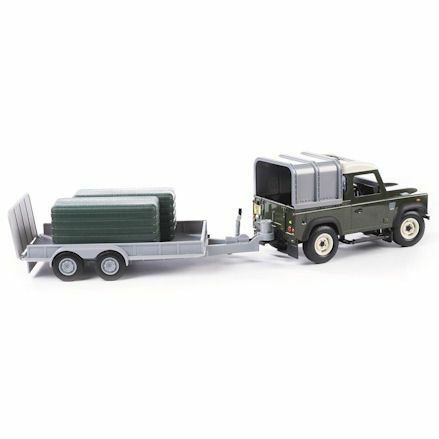 Collecting Big Farm vehicles is a daunting task, but let us tell you you'll get off to a good start with this Land Rover and trailer set as an affordable option. The trailer doesn't offer much in functionality, in fact it only offers a folding down tail gate well it sit's on a twin axle. The big coupling mechanism will quite easily fix to the Land Rover well a jack can be lowered if the trailer is detached anytime - just to keep it up right. Simple as it is, with its large flat bed design, you can pretty much haul anything there imagination can muster, from the two green bales that come with it to a smaller vehicle. As usual, the Land Rover has sounds and noises, steering and detachable canopy. 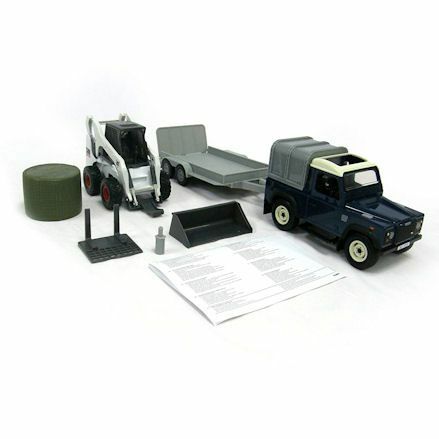 Similar to the Land Rover and trailer set as featured above, only this Land Rover is blue and comes with a functional Bobcat skid steer, all in 1:16 scale of course. You can use the Land Rover and general purpose trailer as it is, but will allow the skid steer to roll up the fold down tailgate so it can be transported on the trailer. What's more interesting is the Bobcat has a tonne of features itself; from the free rolling wheels, the up and down movement of the loader to the detachable attachments. The big round green bale can be used for transporting in the trailer, well the Bobcat skid steer has a special fork attachment designed specifically to pick up the bale. Again, the Land Rover offers you all the usual features, from the engines sounds and horn, to the steerable wheels and detachable canopy. 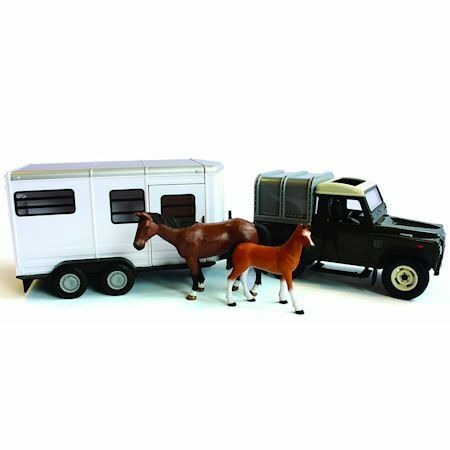 You can't run a Big Farm stable without the use of a compatible horse trailer for towing the 1:16 horses, so Britains have you sorted with two options. 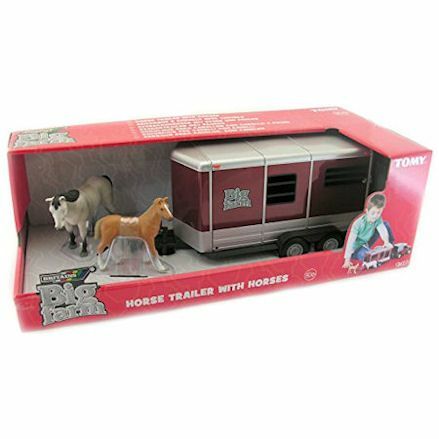 Despite them offering the exact same features, you can choose between a white trailer or burgundy toy horse trailer (also known as a horse box). Expect both trailers to have a fold-down ramp, two compartments, a side-access door, twin-axle with free rolling wheels, plus a wheel jack for balancing. 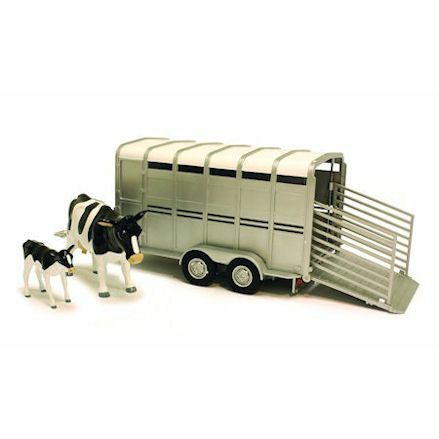 Each horse trailer set comes with horses, a mare and foal that are coloured differently. To get you off the ground right away, take into consideration the white horse trailer box is available as a standalone model, or is available with a matching Land Rover. 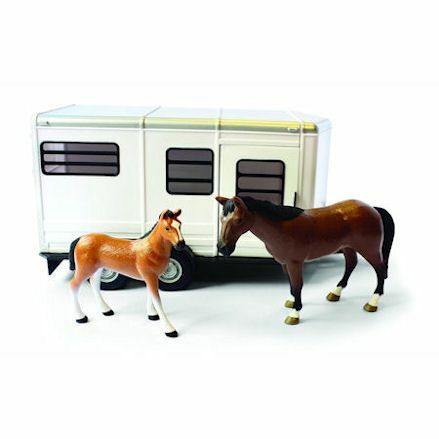 Their first horse trailer available in the equestrian series is this horse trailer with horse and foal, featuring a tow bar, jockey wheel, drop down tailgate with a ramp. Released in 2012, the horse trailer has a few interesting functional parts that will add value similar to other brands in their horse trailers. But first let us say; we would highly recommend using this trailer exclusively with a Big Farm Land Rover Discovery - use with a Big Farm tractor will simply look out of place. Obviously the most interesting feature of this trailers is the compartment suitable for the horse and foal that comes with the trailer. The door will fold down into a ramp, whereby the horses then walk into one of the two compartments, separated by the divide. Once hooked up to a Land Rover using the simple hook tow bar, its supported with a twin-axle. Though once detached, the jack wheel will keep it balanced. One of two Big Farm horse trailers comes this burgundy version, well its looks (in our opinion, more attractive) its does exactly the same thing. With that in mind, its just a matter of taste and a choice between this 2015 release or the earlier 2012 release. This version has two horses again (a mare and foal) with two very different coloring, but are both compatible with the trailers, and will slide right in there with ease. The two divided compartments will be used for horses, well the foal will just about be able to squeeze through the side access door. The horse trailer sit's on a twin-axle in the centre, well a jockey wheel will help it balance when its detached from the Land Rover. Be sure to use this trailer with the red Land Rover for the perfect match. Thanks to the success of their first release, comes this Britains Big Farm horse trailer, again complete with horses, rear pull down ramp and tow bar. Like most horse trailers the rear ramp will fold down so the horses can access the box with ease, with no steps to climb. Within this horse box there's a divide that splits the trailers into two compartments, great for transporting horses in safety. As the trailer comes with a horse (or mare) to be precise and a foal, they will travel regularly together. A simple tow bar will hook onto the Land Rover Discovery with ease. A side-access door on the left of the horse trailer allows access for people. Not to worry, if you've got yourself a Big Farm trailer but expecting Britains logo on the box instead of ERTL, it will still fit perfectly fine. The thing is see, ERTL are the name of Britains in the USA, and well the American's don't use the Britains brand, they use ERTL instead. Well Britains/ERTL are both owned by TOMY and marketed differently to the UK and US markets, often a ERTL Big Farm trailer will be exported to Britain and end up in our range - but both brands are cross-compatible. So let's take a look at the most common ERTL trailers we have here i nthe UK. 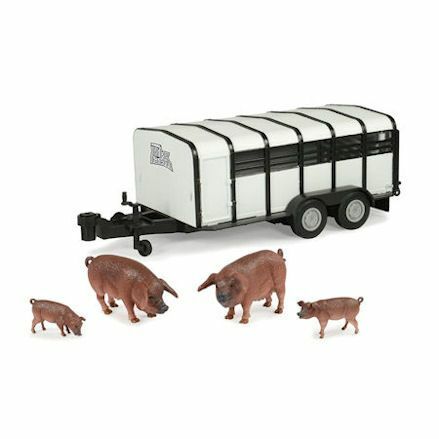 If it's smaller farm animals you own - like pigs and sheep - then go for hog trailer with hogs, designed specially for hauling small animals. Now, using the word hog should be a big giveaway, here in the UK we don't use the term to describe pigs, we simply call them pigs. In the US, they do say pigs also but the term hogs are more widely used, hence the product name of Big Farm hog trailer with hogs. Fully compatible hog trailer that will hitch to the rear coupling of any Britains Big Farm Land Rover Defender or tractor. To access the trailer, open rear doors and fold down ramp with support bars. 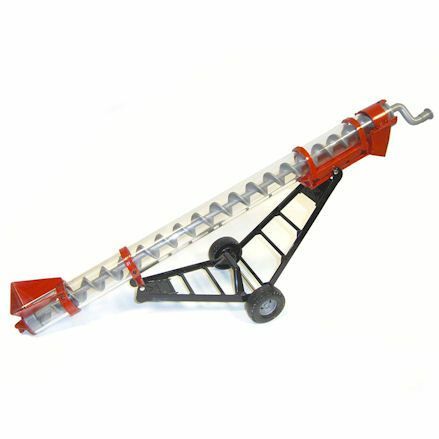 Here we have a screw like conveyer or an auger conveyer for use with grain, the purpose of this complicated piece of farm equipment is quite simple. It is used to bring grain up from a box that is loaded with grain, then uses a mechanism that brings the contents upwards in a winding motion before emptying out the end. This ERTL Big Farm grain auger does indeed have that function, its then towed to or from the farm behind a Britains Big Farm tractor on the hitch. We must warn you it doesn't look right towed behind a Land Rover. Bring in the grain auger when you need to empty the grain/silo bins of grain into the tractor tractor; likewise you can offload the grain into the grain bins. 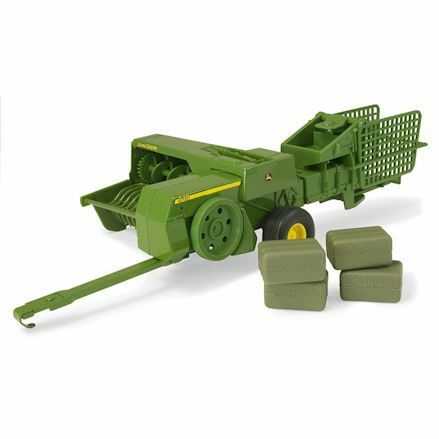 This ERTL John Deere square baler is not something we would use in the UK, our round balers are farm more compact. And this one can be recognised as a ERTL model simply by its shape and size. But like we've previously advised, this bad boy will fix to any Britains Big Farm trailer, and towed through the fields making square bales - not really of course. Fun can be had with the four square silage bales that can be stored and transported in the baler, then dropped off on the field to be picked up later. The tow coupling is different on this model so will only connect to a tractor. But try to make it a John Deere one as it will look fantastic matched up.